I’m thinking about joining a fraternity this semester. I have several people in my family who are alcoholics, and I’ve heard that a family history of alcoholism can put a person at a greater risk of becoming an alcoholic him or herself. I don’t currently have a problem, but I’m worried about the possibilities as I have heard alcoholism described as both a mental illness and a physical disease. Which is it? It is true that alcoholism is listed in the Diagnostic and Statistical Manual of Mental Disorders (DSM-III) and is considered to be a mental illness. There are 17.6 million alcoholics in the United States. Are they all mentally ill? Well, yes - but we need to remember that mental illness is not the same as “craziness.” Mental illness covers a huge range of diseases. Mental illnesses are not so different from physical illnesses as your phrasing implies. In fact, mental illnesses can often show themselves within the physical working of our brains, and similarly mental illnesses can be hereditary in much the same way as illnesses of the body can be - because, of course, they are illnesses of the body, too! Alcoholism is classified as a substance abuse disorder within the DSM-III. It's not the only substance abuse disorder listed, of course: most of the addictions you are familiar with show up on its pages. Even though there is a physical component to many of these addictions, they are considered mental illnesses for a few different reasons. One reason that alcoholism is classified this way is that it has symptoms consistent with mental illness. While many physical illnesses can affect a person’s mood, alcoholism and other addictions transform a person’s behavior. An alcoholic craves alcohol and can act irrationally in the pursuit of it, allowing professional and personal obligations to fall by the wayside. These are, clearly, behavioral symptoms, and behavioral changes tend to be the domain of mental illness. In fact, the behavioral changes associated with alcoholism usually surface long before the physical symptoms. Heavy drinking can do terrible things to your body, of course, but this wear-and-tear can take time. With the exception of the terrible consequences of overdosing on alcohol, the physical symptoms of alcohol can a while to manifest: months, years, and even decades may pass before they show up. Early diagnosis of alcoholism relies largely on behavioral signs, such as an individual’s inability to stop drinking or to make good decisions about drinking habits. In fact, mental signs can actually help predict alcoholism - though research in this area is very limited. 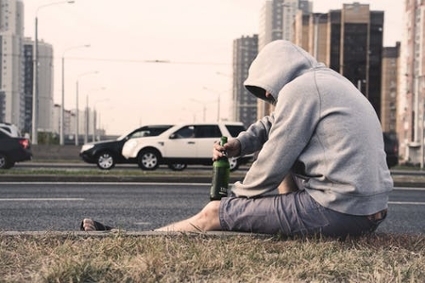 While no particular type of “addictive personality” seems to lead to alcoholism, a disproportionate number of alcoholics are antisocial youths. There is, of course, a physical side to most addictions. Physically addicting substances - of which alcohol is one - affect our brain, and our brain reacts. Depending on the substance in question, our brain may shut down (or activate) certain receptors or make less (or more) of a given substance of its own. The brain is trying to balance things out - but, of course, things are only balanced when we keep supplying our brain with whatever substance it is that we are abusing. Remove that substance, and the addict exhibits withdrawal symptoms, a staple of physical addiction. This is why the experts at the Hazelden Betty Ford Foundation say that alcoholism “combines the elements of both mental illness and physical disease.” Successful treatments for alcohol abuse focus on the dual nature of the disease. Rehabs remove alcoholics from the substance that they are physically dependent on, but they also provide counseling and other treatments designed to address the mental side of alcoholism. A general practitioner can play a role in alcohol recovery, just as a mental health professional can. Alcoholism’s nature does not preclude it from being a hereditary disease - after all, other mental illnesses (such as depression) can run in families, too. Scientists believe that both genetics and environmental factors play a role. Unfortunately, those with parents or siblings who are alcoholics are thought to be between four and nine times more likely to become alcoholics themselves. (Suzanne Hite, former publications editor serving the technology services sector).